There is a rapidly-forming consensus that policymakers should commit to specific levels of deficit reduction over the next 10 years. At a press conference earlier this month, President Obama endorsed a specific 10-year savings target of $1.5 trillion, arguing that two years ago there was a consensus that “we need[ed] about $4 trillion to stabilize our debt and our deficit, which means we need about $1.5 trillion more.” This is consistent with the Center on Budget and Policy Priorities’ recommendation that $1.4 trillion in deficit reduction (including interest savings) over the next 10 years be targeted to stabilize the debt ratio (federal debt as a share of total gross domestic product). Various commentators such as Martin Wolf of the Financial Times and Paul Krugman of the New York Times have noted that this amount of deficit reduction is modest, and consequently suggest that policymakers instead focus on the more pressing priority of job creation and rapidly lowering unemployment. But the case for turning to job creation is even stronger than perhaps they realize: this analysis shows that the debt ratio can be stabilized with less than $1.4 trillion. And more importantly, there actually isn’t a single minimum target necessary; if coupled with near-term stimulus, the debt ratio could be stabilized without any deficit reduction whatsoever. These levels of deficit reduction would result in a falling debt ratio, meaning that the debt could be successfully stabilized with less deficit reduction. The deficit reduction targets incorrectly imply that substantial up-front stimulus—which the economy desperately needs—would have to be offset by additional deficit reduction on the back end. In fact, even in a static model which doesn’t take the economic impact of stimulus into account, higher levels of up-front stimulus don’t make it any more difficult to stabilize the debt—it would simply be stabilized at a slightly higher level. Let’s examine these points separately. The economic rationale that lies behind the $1.4–1.5 trillion in deficit savings is sensible (and we have often invoked it ourselves): As the CBPP clearly states, “… appropriate budget policy is to ensure that the debt ratio [the value of debt divided by GDP] does not rise during normal economic times.” The “during normal economic times” qualifier is particularly important here: CBO projects that the economy will remain below potential until 2018, meaning that the relevant measure isn’t the current debt ratio, but rather the ratio in 2018 and beyond. And perhaps more importantly, it is not the ratio per se that is important but rather whether the ratio is falling or rising—in other words, it is the slope of the debt ratio trajectory rather than the debt ratio level itself that is important. One way to operationalize this rule in the current context would be to target the slope of the debt path in the last five years of the 10-year window. For example, if debt/GDP is lower in 2022 than it is in 2018, then the debt is stabilized. We find that stabilizing the debt ratio under this rule can be accomplished with roughly $670 billion in deficit reduction, which includes $580 billion in policy savings and $90 billion in interest savings (see below for methodology, including baselines and phase-in rates). This is just half of what President Obama is calling for. Using CBPP’s slightly different baseline (they used an estimated December baseline while we used CBO’s last official baseline, published in August), applying this rule of debt stabilization would require just under a $1 trillion in total deficit reduction, rather than its stated $1.4 trillion finding. Another way to operationalize this debt stabilization rule would be to target the deficit that is associated with long-run stabilization at the current debt ratio in 2012. For example, the current 72.8 percent debt level could be stabilized with a long-run deficit of 3 percent of GDP (though this stabilization would happen outside the 10-year window). Achieving an average 3 percent deficit over the last five years of the 10-year window would require even less deficit reduction, roughly $500 billion total ($430 billion in policy savings and $70 billion in interest savings). 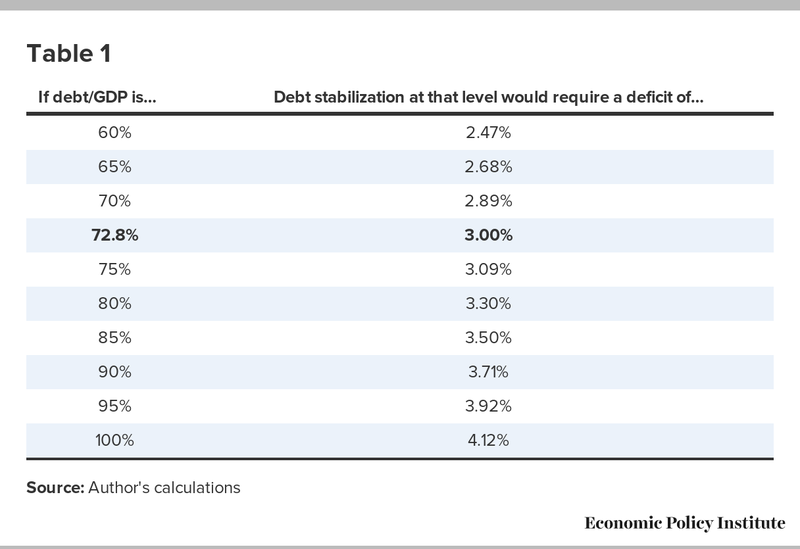 The table below show the average deficit associated with debt stabilization at various debt ratios. There are two key insights to take from this exercise. First, the level of deficit reduction “needed” to stabilize the debt is highly sensitive to how “debt stabilization” is operationalized, which itself tends to be arbitrary. Second, the higher the starting debt ratio is, the less stringent the deficit target needed to stabilize at that level. It is true that it will result in a higher debt ratio level, but again, it is the trajectory—rather than the level itself—that is the proper target of policy (claims that specific debt ratio levels should be targeted are hogwash). It should be noted, however, that if the long-run interest rate rises above the long-run growth rate, then a higher debt level will make stabilization harder—rather than easier—because of the interest costs of servicing the existing debt stock. It is unclear how President Obama came up with the $1.5 trillion target that appears to overshoot debt stabilization. His shorthand explanation at the press conference—that he subtracted the deficit reduction to date from the Bowles-Simpson $4 trillion target—would imply that he is using a very out-of-date baseline, a big no-no in the budget policy world. The CBPP rationale for the $1.4 trillion target is better-founded, based on a target annual deficit of 2.5 percent of GDP over the last five years of the 10-year window. This target, however, still seems to overshoot the goal of debt ratio stability. As the graph below shows, $1.4 trillion in deficit reduction would actually cause debt to fall between 2014 and 2022, as would the president’s $1.5 trillion. Another big problem with promoting an aggressive 10-year deficit reduction target is that it suggests that stabilization acts as a hard budget constraint, and that up-front stimulus—such as infrastructure investment, unemployment insurance, refundable tax credits, and state and local budget relief—would make the task of stabilizing the debt more difficult because it would have to be paid for with additional deficit reduction to maintain stabilization. This suggestion, however, is completely wrong, and its wrongness reveals the fallacy of the whole idea that there is a specific number needed to achieve debt stabilization. There are two reasons that stimulus makes stabilization easier rather than harder. First, the economic boost from properly-constructed stimulus (i.e., policies that have high multipliers) can itself reduce the debt/GDP ratio over time. Partly this is because more people employed means higher tax revenues and less reliance on the social safety net (thereby reducing debt incurred as the cyclical budget deficit falls), and also because a larger economy makes the dollar value of the public debt more manageable. Josh’s back-of-the-envelope calculations show that a $150 billion stimulus with a 1.5 multiplier (e.g., a combination of generic government spending and transfer payments to low-income households) would increase the debt by $71 billion after taking into account revenue and spending feedbacks, but it would also increase GDP by $225 billion, meaning that the debt ratio would actually fall by roughly half a percentage point. Larry Summers and Brad DeLong have also found that deficit-financed fiscal stimulus is likely fully self-financing, even in dollar terms when one considers the long-term impact. Some of this is related to historically low interest rates, but the more significant effect is the avoidance of continued economic scarring, which occurs when inadequate demand reduces the economy’s long-run potential as productive resources go unused and atrophy (e.g., shuttered factories and forgotten labor skills). But even if we leave aside the economic benefits of stimulus (and its associated deficit-reducing cyclical feedbacks), it is still the case that stimulus does not make it more difficult to stabilize the debt over the 10-year window. The graph below shows two scenarios. The first scenario is $670 billion in total savings, including $580 billion in policy savings plus $90 billion in interest savings. As mentioned above, this scenario portrays the lowest amount of deficit reduction that will still achieve a 2022 debt level that is lower than 2018. The second scenario includes $1.2 trillion of stimulus spread evenly over the first three years (2013–2015). The graph clearly shows that while the scenario with stimulus stabilizes at a higher debt ratio , it is still stable even though it would actually entail a net deficit increase of $865 trillion over the decade. In fact, though $670 billion with no stimulus is the lowest deficit reduction necessary to stabilize the debt ratio using the 2018–2022 measure, including the $1.2 trillion stimulus actually lowers the gross deficit reduction threshold for stabilization to $590 billion ($510 billion in policy savings), even though on net the deficit would rise by $950 billion. In other words, there is no single answer to the question of how much deficit reduction we need to stabilize the debt. Instead, there are a variety of options to achieve different versions of debt stabilization, and while some require spending cuts and revenue increases, others—i.e., those that rely on substantial stimulus—do not. So what policymakers face now is a clear choice between two options. The first option attempts to achieve debt stability through austerity. This carries the risk of both undermining the fragile economic recovery (and thereby putting full recovery and debt stability further out of reach) and likely weakening middle class retirement and health security. The second option would achieve debt stability while also addressing the real national crisis: the lack of jobs and heightened economic insecurity. The choice is ours. The current policy baseline, which the two proposals are modeled off of, assumes that the DocFix is permanently extended, that the wars will continue to be drawn down, and that the sequester will be repealed. Consistent with CBPP and the Committee for a Responsible Federal Budget, it also assumes that the remaining tax extenders either expire or are paid for. The savings are assumed to use the same phase-in rate as CBPP uses: savings are phased-in from 2014 to 2016 using step basis (2014 savings double by 2015 and triple by 2016), and after 2016 savings are assumed to grow by 6.7 percent, which is the un-weighted average of growth in revenue and Medicare under the current policy baseline. It should be noted that the deficit reductions “needed” to stabilize the debt are even lower if we instead assume that savings are phased in at the same rate as the proposed revenue and mandatory savings in President Obama’s FY13 budget.